Dakota Access (Enbridge) has given notice to Standing Rock that they plan to start construction on the Missouri River on the morning of Friday August 5th 2016. The Camp of the Sacred Stones is calling for everyone who is available to come join the frontlines. Wednesday morning Dakota Access sent a 48 hour construction notice to the Standing Rock tribe. Now is the time to come stand with them. Calling all earth & water defenders! Protect sacred water! Four tribes are suing but the State will not force the company to stop. In the meantime, while the lawsuits are being addressed, people must stop them to buy time. This is as clear of a purpose for Direct Action as you will ever see. Donate online if you can’t come to the camp but what is really what is needed is bodies to hold the line. This is no different from the Keystone XL which 125,000 people pledged to resist. Where is everyone? Do we need multi-million dollar marketing campaigns to feel the urgency? Contact the camp if you can support in anyway possible. 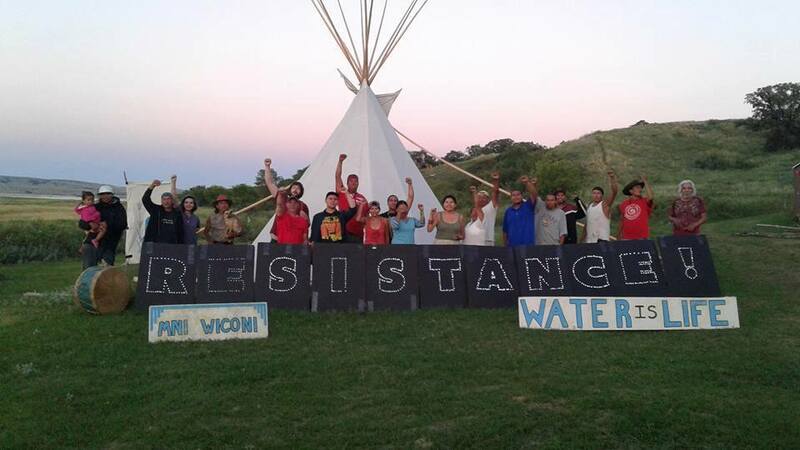 Stand strong No Dakota Access in Treaty Territory – Camp of the Sacred Stones! Rising up in protection of Unci Maka and the sacred!! How to help? Donate. Get your boots on the ground! Get to the CAMP or organize a SOLIDARITY event. Flood their phones with the Call-In Campaign. Flood their phone lines to let them know where we stand! Once you call please comment on the event and describe any comments you received. Flood their phones & tell them to stop the Dakota Access Pipeline! Share this and spread it far and wide!